After some years of using a standard merge-format letter, I sat down with Descanso Gardens to rework their membership renewal system with the goal of a more attention-grabbing letter, a push for membership upgrade, and incorporation of a new membership campaign. Their previous 2 packages had been in use for a few years in a row, and one concern was that viewing fatigue was causing recipients to ignore the mailing. Another item high on the list of additions was the ability to showcase new events outside the letter body. Since a full-color merge document has to be done on a digital press, I thought we should maximize on the versatility of the process and make seasonally-themed ever-changing letters. We decided on a system that showcases a monthly theme for each mid-month mailing with timely event info to encourage engagement. Due to the changing theme, each recipient gets a different letter ahead of expiration from the one post-expiration to keep the look fresh and attention focused. While the letter body makes the case for membership in prose, we added an upgrade ask and a 2-year ask on the reply slip. The letter back does the heavy lifting of describing each membership level and benefit so recipients can make the best choice for their household. The renewal letter was the first rollout of the We Grow More Than Plants campaign, where the focus is on people engaging with the Gardens and experiencing nature. Each layout has 3 placements of seasonal photos that change monthly along with color blocks to contrast. The letters feel like a series while each is a unique opportunity to show everything Descanso is up to. We’re coming up on completing our first year, and I’m really pleased with how these have turned out. I recently had the pleasure of working with my very talented friend, Jonathan Silberman, in helping him launch his latest venture, Character Projects, a vintage lighting and hardware store, period home design services, and real estate specializing in historic homes around northeast LA. This project was very close to my heart, as it took place during our very own search for an arts & crafts-era fixer under Jonathan’s excellent advice and guidance. Talk about getting to know a client’s business! Having first-hand experience allows me to say, without reservation, Jonathan is my top recommendation in all aspects of home restoration with a sensitivity to period accuracy. Branding for a service business can be tricky, especially one where the customer stewardship will become the most memorable experience for clients. Lucky for the visuals here, Jonathan pairs service with meticulously restored pieces that speak for themselves. At first we created a wordmark that was much more demonstrative of vintage style, but ultimately we decided to back off and go clean and timeless, allowing the products to do the talking. Since Jonathan has such rich imagery to show, we went with moo cards, so he could have as many alternate photos as he wants, adding new sets as needed. This business started as an online store, but grew into a physical studio within a few months. Jonathan picked out some nice tags for pricing and product info, and we worked up some stamps he could use in marking these and other materials, such as tissue, stickers and shipping packages. We gave him a site that allows for changing content on the home page, while putting a spotlight on each of his services on separate pages. His store links directly to Etsy, where he enjoys the overlap of social shopping with targeted demographics there, so all he has to maintain is changing content, which is easy and intuitive on the WordPress platform. Once his site was up, he was all ready to start promoting the opening of his store in Highland Park. Character Projects is off to a great start, with a small but effective package of identity materials to help Jonathan grow his business. Visit Character Projects online and dare yourself not to consider remodeling your home. + See the full project here. If you’re just starting a new business, you’ve got a clean slate to take it in any direction. A starter branding package can get any new venture off the ground, targeting the right materials for promotion without anything you don’t need. Say hello anytime and let us know how we can help. I’m excited to be a part of revitalizing a neighborhood bookstore in their 75th year of operation! 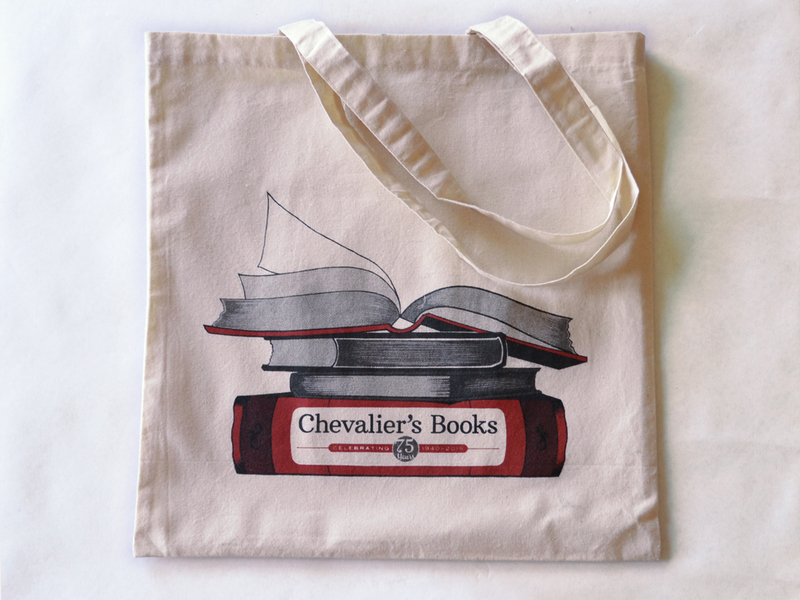 Chevalier’s Books is a mainstay of Larchmont Village and beloved by the locals, though they’ve been struggling in the age of Amazon and changing times. 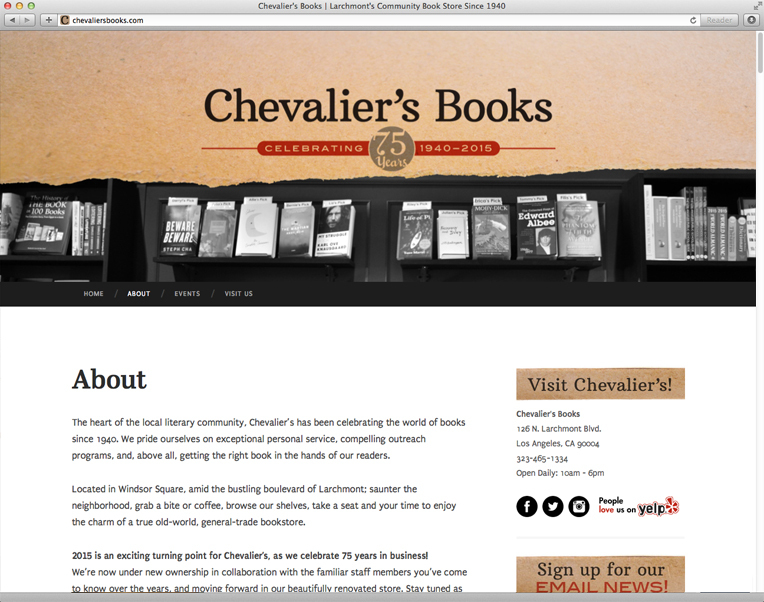 Enter new owners and dedicated bibliophiles Darryl Holter and Bert Deixler with great plans, energy and funds, to give Chevalier’s just what it needs to come back in a big way. 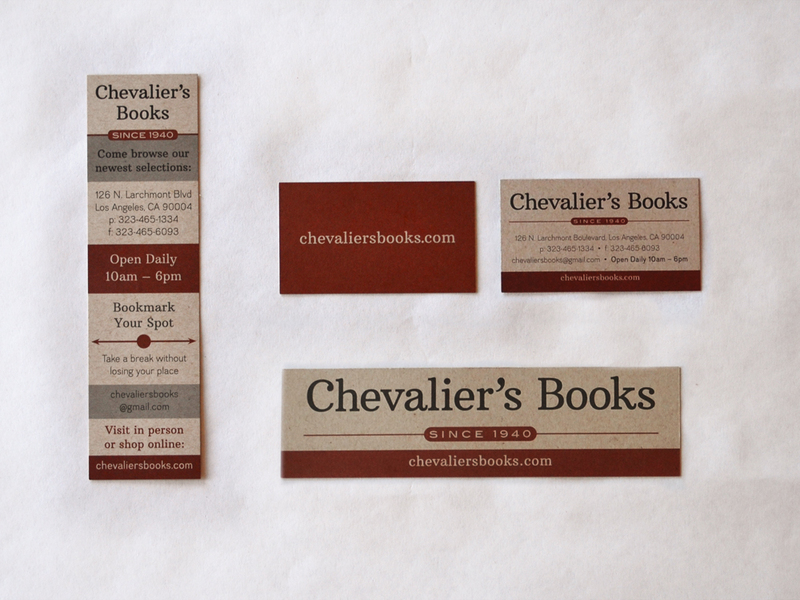 Our main goals with redesigning this store brand was to appeal to everyone who loves books, bookstores, and keeping LA history alive, and give them a comfortable space to shop, meet, and convene for readings and events. The space is inviting and comfortable, with a great selection and an expert staff. We gave them a very literary wordmark, with a sign-off that reiterates their founding year, which is easily versatile enough to adapt for their 75th anniversary. To follow it out, we have matching business cards, gift bookmarks, merchandise bags, and an economically friendly canvas bag. For the web site, we wanted to give them all the blogging and writing capabilities they’d need to promote readings, signings, intimate concerts, book club meetings, and membership, bringing some of the store experience online. The wordpress platform is simple enough for employees to update and integrate with social media, and the look packs all the information they need into a very clean, streamlined layout. In the first few months after re-opening, Chevalier’s was reporting record sales numbers in the holiday season. I’m excited to see where they take things in the coming years. In the meantime, check them out online! You don’t need to be a new business to need a new brand & identity. Most of our clients are looking for a refresh & recharge approach, integrating previous efforts seamlessly into an elevated look going forward. If this sounds like just what you need, let’s talk! For the past 7 months, I’ve been hard at work with Natural Curiosities, a collective of artists and artisans working under the creative direction of Christopher Wilcox in a beautiful studio in the Jensen Recreation Center, here in Echo Park. They have evolved from roots in archival giclée printing and silk screen to application and specimen art, gold & silver leafing, aging and paper treating, and hand watercoloring. They have a specific aesthetic celebrating a time when both scientists and artists were constantly observing and cataloging nature, and they’ve brought this around from archives of illustrations to three-dimensional recreations and objet d’art. With all these new developments afoot, it was time to do a little identity refresh, and refocus the web site on communicating all the exciting news in more of a real-time way. Starting with research, we did a full company-wide brand exploration. You never know what you might find when you interview everyone in a company, but it was exciting to see how passionate everyone was about their work and the family environment in the art house. They all offered great ideas and perspectives that we incorporated into a report, and further refined into a brand brief to guide the project. 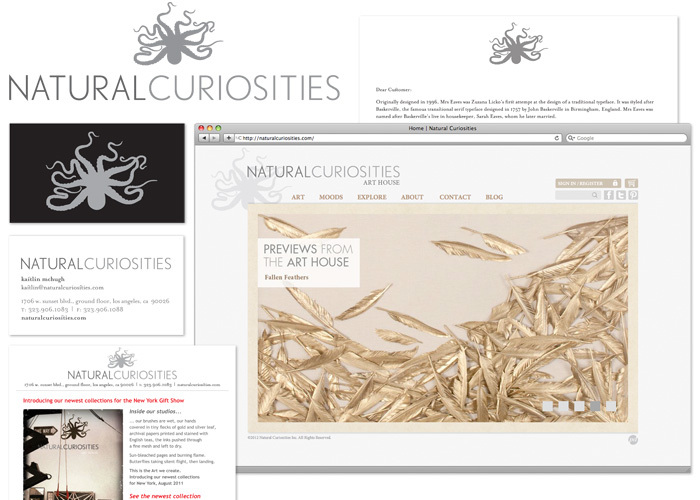 Natural Curiosities had already developed a lovely logo and wordmark, so the job of standardizing its ratio, lockup, and uses was easy. The main goals boiled down to 2 things: create a marketing strategy that would communicate the brand philosophy, and design a web site that would serve both the marketing strategy and the clients. 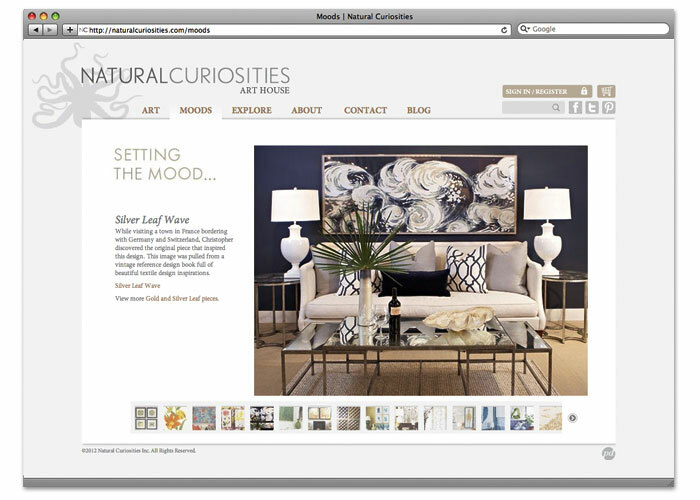 as a wholesaler, the clients of natural curiosities are partners and external sales rather than consumers, though the site is used as a catalog to consumers as well, and has to serve both markets seamlessly. The previous site was very strong on products, but needed more of a bridge to the promotional engine and client relations. Research told us that people really love interfacing with the staff and studio, so another goal was to bring more of that experience to the surface of all communications. On the technical side, this site was built in Drupal and would stay in Drupal, but had to become far easier to update by employees. One of the first challenges we faced was how to pull specific pieces out of the archive and showcase them. 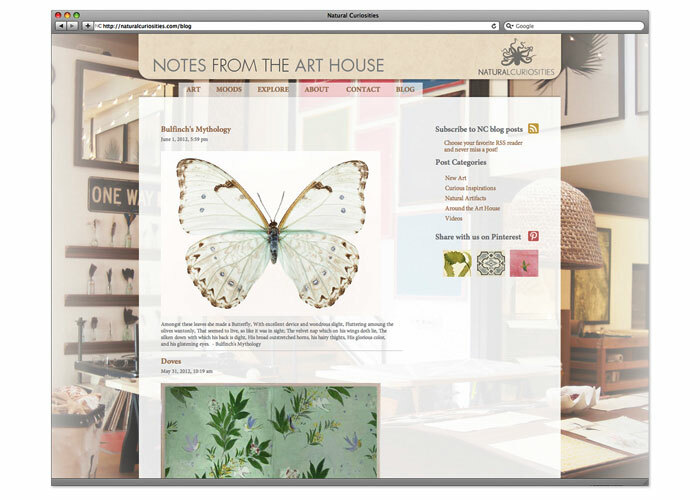 With a catalog as big as that which Natural Curiosities sells, even after a streamlining, we’re still faced with many collections and sub-collections, relying on the user to find them either by browsing or searching. 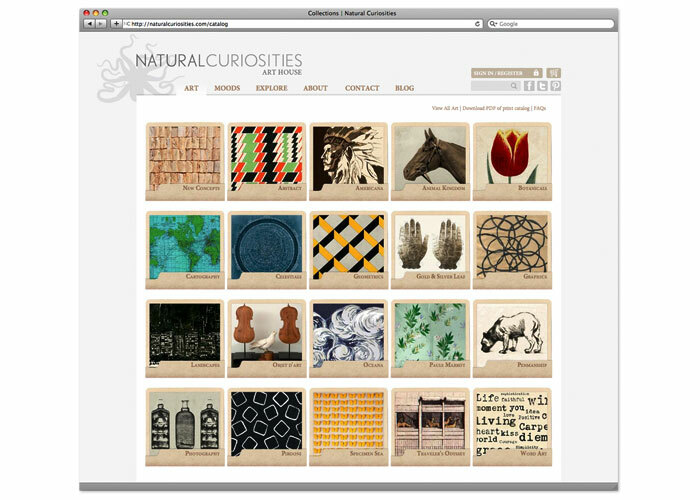 In reworking the home page, we decided on a 5-image slide show, showing a full-screen close-up of any one piece of art that Natural Curiosities would like to feature, with each linking to the appropriate product or collection. Previews from the art house is their way of visually showcasing breaking news or exciting products, which is very easy to update on the fly. Our first task was to map out the art catalog, which was no small feat. Flow charts, graphics and full wall murals were involved! The general feeling was that the categories and collections were not intuitive enough, so we reworked the names, resorted the art, refreshed the overall collection [adding new pieces, retiring others] and stacked it into a grid of highly-colorful art folios to reiterate the sense of archive. This is a main landing page for regular site users, so it has become more inviting, and easier to use. Another section ripe for opportunity was the search function, which wasn’t returning as many results as it could, and showed the results more like data records than art. We installed a module that would perform a wider search, give the user options to narrow the search by category, and suggest alternatives, with results coming in as large thumbnails for quick preview and selection. The product pages have been rearranged to be image first, support information second for visually-driven clients. When authorized users are logged in, pricing and buying options appear here as well. With clients in mind, we decided to add a design & interior-focused section to put art in context into the spotlight. This is a more extensive slide show which offers Natural Curiosities another way to showcase products, overlay editorial and cross-link styles from inspiration shots to related collections or blog posts. It’s also the first of a few more client-partnership aspects we’re building into the site. a new & improved blog! As another, more dynamic opportunity for communication, we’ve introduced a new blog with a unique layout from the rest of the site, and an editorial calendar to fill it with sources of beautiful design inspiration, product showcases, video posts and news missives. The blog is going to be a pivotal point of the communication strategy, as another place to bring clients into the natural curiosities experience. 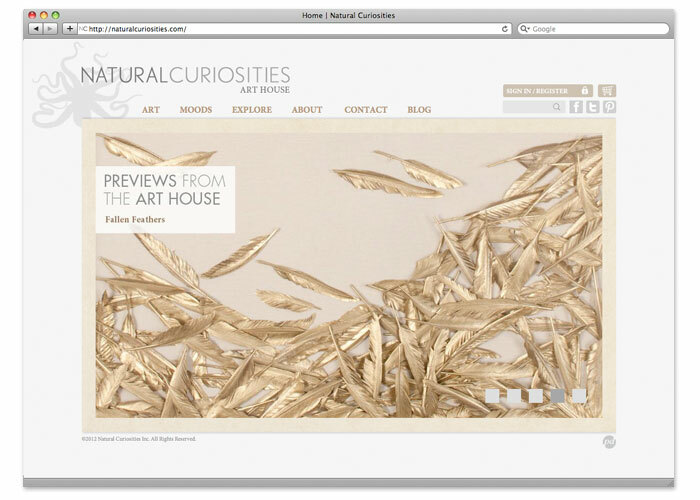 + See more of our work for Natural Curiosities. We recently gave Tony’s Darts Away a little makeover online and wanted to share it with you. If you’re familiar with the All Craft, All Draught, All California bar in Burbank, you know they’ve been making a name for themselves as celebrationists of some of the finest California craft beer. Before we even got involved, LA weekly cited their site in a top 5 of LA restaurants others could learn from, so we wanted to keep it as accessible and informative as it’s always been, with more muscle on the back end and make it more easily expandable as their web presence grows. Their contact info & hours are built into every page, their site pages have been sorted into simple main categories, and we’re porting tweets into a sidebar so they can announce events and late keg tappings after opening. Similar to what we did for Mohawk Bend, we gave Tony’s Darts Away an interactive beer list to make browsing, searching and sorting easy. On the back end, this list is easy for employees to manage and update, so the menu stays updated all the time. Something unique that has garnered this site some attention is the beer styles library where visitors can research and read tasting notes and anecdotes on all kinds of craft beer styles they might encounter at Tony’s and beyond. Click a style in the sidebar and the text loads in the center. We also set up the brewers list the same way, so if you’re curious who’s who and what’s what, take a look! + See more of our work for tony’s pubs. As the saying goes, I love it when a plan comes together. When I first talked to Tony Yanow about his newest venture, Mohawk Bend, it was nearly a year ago, midway through the Ramona Theater’s renovation process. While we’d be working from scratch design-wise, Tony had a very clear idea of who he was serving and what the attitude and voice of Mohawk Bend would be, which made the preliminary research and brand brief development really easy. He also had an interior design team working with the raw materials of the space and adding beautiful custom furniture in light wood and warm, orange tones. From the outset, we knew the setting of where the identity would live and how we could make it stand out appropriately within that environment. Mohawk Bend has a few different areas of focus, but it’s first and foremost a celebration of craft beer from all over California. The most exciting and innovative of these is the hops-forward west coast IPA, and in that vein, the hop flower became a main feature of the logo. Beyond beer, though, their plans included California-sourced spirits, a bottle-free selection of California wine, local / organic food that spans the vegan-omnivore spectrum, and a low-waste operation in the kitchen. Tony really wanted an icon system that could represent each of these aspects and work interchangeably with the main identity, play out on the web site, and associate with core staff’s areas of expertise. We developed a color palette and selection of icons that swap out with the hop flower in the logo for specialized uses, and become indicators for each area of the web site. For future signage and events, they’ll have the versatility of growing this icon system with new developments. Creating the web site was a fun exercise in brainstorming all the things we hate about restaurant web sites and putting them at the top of the list of what not to do. No flash, No pdf menus, No hard-to-find location information. Tony was always very clear about the voice of Mohawk Bend, that it’s craft first in a simple and honest way. We were still excited to talk about all the great things Mohawk Bend does, however, so we built all of it into the about section, so the information is there without being an obstacle on the home page. Instead, a styled twitter widget announces daily specials and events, with clear postings of hours, location, directions and a list of menus: get the info you need and come on over! One particularly fun feature is the interactive beer list. During our preliminary talks on functionality of the site, Tony said “What I’d really like to have is a beer list you can sort by any category—brewery, style, alcohol volume…” And so we thought about it, and worked out a solution that integrates directly with WordPress, allowing all the searching & sorting a curious beerophile would want. Click any column header to sort by that column, or use the search field to isolate beers containing your search terms. We also translated everything to a nice mobile site, so anyone can find just what they’re looking for [even search the beer list] on the go. Behind the scenes was the real challenge: developing a workflow system that would allow daily menu updates in print and online to be done easily and quickly by employees. A system that still uses nice typefaces and formatting in print, but doesn’t require any coding online—and all simple enough to execute well without a design education. Once we settled on a menu format, we built in-house layout templates using paragraph styles that would transfer heading tags and basic bold and italic formatting to WordPress. The WordPress interface is extremely user-friendly, with a visual editor, so everyone has taken to it quickly. To keep the carbon footprint low, the menus are printed on Neenah Environment 100% post-consumer waste recycled paper. As I’ve watched this roll out in action and seen the Mohawk Bend staff make it their own, I’m proud of the system we created together. They’ve been able to switch around the menu formats easily using feedback from customers, and we’ve been able to build more of the identity into ads, stickers, signage and support collateral. Best of all, they are all super-nice people to work with, so we’re always happy to walk down, have a beer, find out how everything is going, and help them work out their next adventure. Bottoms-up to Mohawk Bend! + See more of our work for Mohawk Bend here.